re you looking to enjoy rainfall like shower every time you visit your bathroom? Well, this is now possible thanks to HotelSpa 30-Setting Ultra-Luxury 3 way Rainfall Shower-Head. This bathroom fixture is designed to deliver a great performance while at the same time help to give your bathroom a well-deserved makeover. This rainfall shower head is equipped with great features and specifications that support its performance. This 3-way multi-functional showerhead or handheld combo allows you to use the two showerheads separately or use rainfall showerhead along with the handheld shower together. This will offer you a choice of up to 30 full as well as combined spray/water flow patterns. It has six settings including pulsating massage, power rain, rainfall/massage, hydrating mist, rain/mist and water-conserving economy rain. 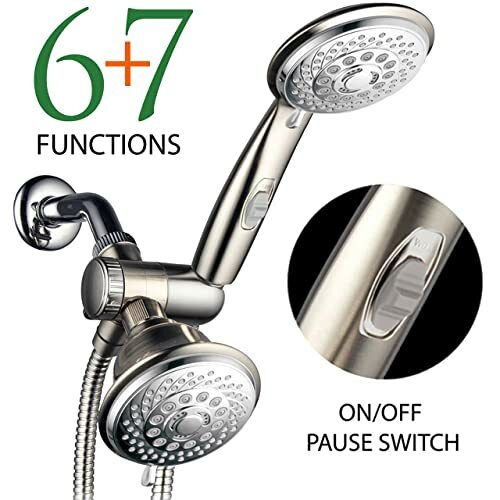 Other features responsible for the showerhead’s great performance include 3-zone Click Lever Dial with Rub-clean Jets and High-power Precision Spiral-Flo dial design. This handheld combo features a futuristic design with contemporary touch. The design is also luxurious. It can fit perfectly in most bathroom décors thanks to its shiny, mirror-like finish. It comes with a 5-ft super flexible stainless steel hose possessing a conical brass hose nuts that allow for easy tightening. The showerhead is made of strong plastic. Installation in tool-free. You do not need to have sophisticated plumbing tools to fix your new handheld combo showerhead. It can connect in just a few minutes to any standard overhead shower arm. Follow the steps provides in the user manual and you will be good to go. This handheld shower combo delivers upto 30 different water flow patters for your choice. It is very easy to install and fits any standard shower arm meaning you can install it in virtually any standard bathroom. It is as many as 6 different settings allowing you to enjoy a wide range of bathing experiences. This fixture self-cleans and very easy to maintain. Besides, it comes with lifetime limited warranty. The angle is adjustable and long hose allow you to take your preferred position. Since it is made of plastic, the showerhead is not as durable and breaks easily if handled poorly. Leaking is a problem with some units but this could have something to do with installation. HotelSpa offers you the best value for your money. With 6 different settings, you will enjoy every bit of your bathing experience. The 30 different flow patterns make this shower a wonderful choice for anyone who wishes to enjoy his or her moments in the bathroom. It also looks great and therefore can help your bathroom have a much-needed makeover.